Urethane Bars are a versatile product well suited for machining into custom items for various applications. Color options are red, black, and natural. UUP's rods are made of tough, crack-resistant, and abrasion-resistant polyurethane, which lasts significantly longer than conventional rubbers and plastics. We provide custom diameters, lengths, hardness. 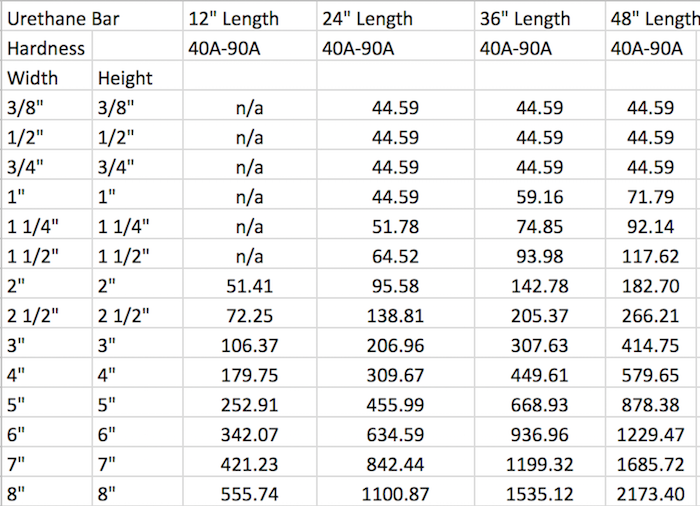 Standard Urethane Bar stock sizes available and in stock. Custom Urethane Bar stock available on request. Our stock cast polyurethane bars are in many sizes. Custom polyurethane bars can be manufactured to meet your unique requirements. Other sizes, even configured shapes, are also regularly manufactured. Polyurethane Bar is often used as a replacement for rubber components and provides an obvious upgrade over the traditional material. Polyurethane has a much improved resistance to wear and can out last other materials by as much as four times. Another advantage is the performance during load and compression, Polyurethane will out perform rubber which will often permanently deform much sooner resulting in the associated components, often vehicle suspension parts becoming loose and causing lack of control and often expensive damage. Its resistance to ageing or perishing, rubber will often degrade over sometimes a short period of time, but this can often be accelerated in UV exposure and the contact with oils and fuels. Polyurethane Bar is also much more resistant to cutting with sharp edges and is also much more impact resistant.